August | 2012 | Things That Go [BLEEP]! I think that Maya could be one of the biggest suprises for Borderlands 2. Her Phaselock ability could potentially be a co-op player’s dream come true. Freezing your enemies in mid-air while all of your buddies light ’em up. 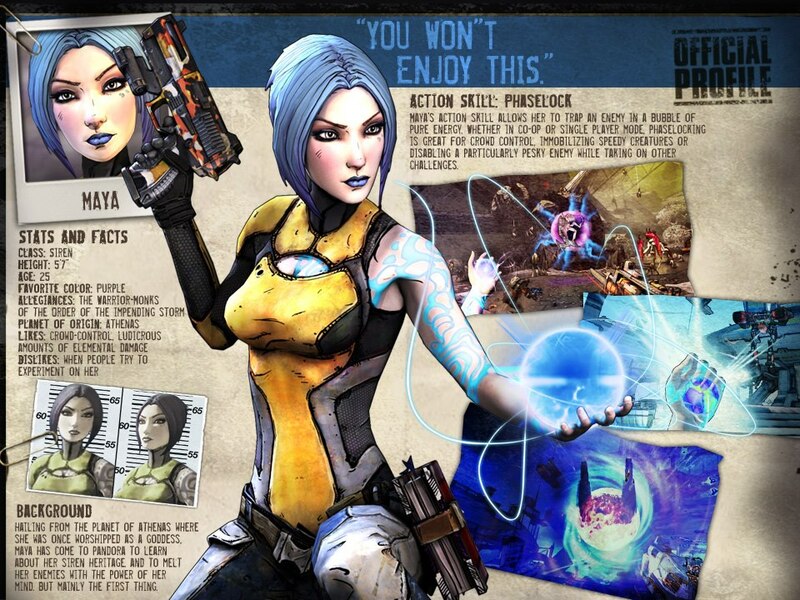 Gearbox has released Maya’s profile for Borderlands 2, check it out! Borderlands 2 can’t get here quick enough for me, but you can expect it to hit stores September 18th, 2012. Mass Effect 3’s single player story continues next week as Bioware is releasing the Leviathan DLC. For those of you unfamiliar with the DLC, check out this trailer. I’d like to see some more single player DLC, even after this one. There have been plenty of multiplayer packs releases, so Bioware let’s get to the core of what Mass Effect was originally about – the single player. Mass Effect 3 Leviathan will arrive on Xbox Live Marketplace August 28th (Tuesday), 2012 for 800 MSP. Will you be buying? Just yesterday some new screenshots of Dishonored snuck in. Keeping up with the promotion of Dishonored is Arkhane Studios/Bethesda Softworks as they have not so quietly released a new trailer. Dishonored is creeping into stores October 9th in North American and October 12th in Europe. Want to know if your favorite wrestler has made the cut in WWE ’13? Check out this video for the full roster! So did your favorite make the cut? Anyone else you’d like to see featured in this years iteration of WWE?